There are many different surface types which we can offer for sport pitches and multi use games areas, these facilities provide great playing characteristics for a number of sports including football, rugby, tennis and basketball. Through working as sports pitch specialists for 20 years we understand that all of our clients have different requirements when it comes to design and budget. This is why we offer a range of options to help give the best playing qualities at an affordable price. Whether you are a school, college, club or leisure centre we’ll be able to design the right sports facility to suit what you need. 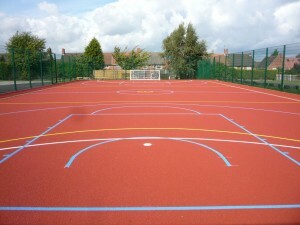 Below you can see the full range of outdoor sport surfaces that we can install. Each of these can come with a flexible design to suit different area sizes and budgets. These flooring types can all be adapted to suit varying levels of play from recreational to competitive in a number of sporting activities. Please feel free to contact our team if you would like some advice on the prices and specifications. This is the most advanced technology of synthetic turf sport surfacing and provides ideal playing characteristics for football and rugby. 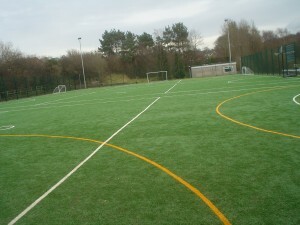 The 3G astroturf is infilled with rubber crumb particles which help to support the grass fibres and keep them upright. Our sports pitch specialists are able to install this specification to suit a variety of dimensions and playing requirements. This work is often done for football and rugby clubs, as well as schools and local leisure centres across the UK. 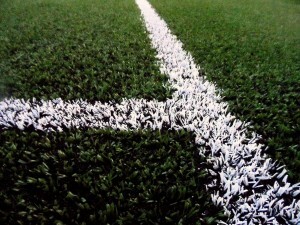 The 3G pitch surfacing can have a shockpad fitted underneath to offer better protection for players’ joints and muscles. This is required for pitches that are going to be used for rugby, but it is not always necessary if the area will only be used for playing football. As the designs can vary, prices will also change based on what you want, as well as your location, budget and the overall size of the facility. Please speak to us if you have any questions about the services we offer, one of our experts will get back to you as soon as possible with more information. 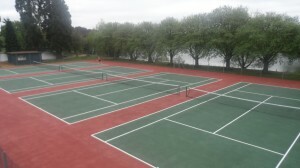 This surface type can be either sand filled or sand dressed and has a slightly different specification depending on the sports which are going to be played on it. The 2G sand filled synthetic grass gives great playing characteristics for a number of sports including football and tennis, as well as hockey. With the sand filled specification, a sand infill is applied within the fibres of the carpet to improve the stability and add better performance qualities. 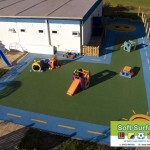 Many schools and colleges in the UK have this synthetic turf specification installed as it’s quite versatile and can be used for many activities. There is also the option of having a sand dressed pitch if you want a facility which is predominantly for hockey. This design has a shorter pile height and the sand infill is lightly scattered across the top layer of the turf. These qualities make it easier for the ball to glide across the surface, giving a better quality of play. This is an ideal surface type for tennis, basketball, athletics and multi use games areas where a number of sports are played. The polymeric rubber court surfacing provides great ball bounce and slip resistance qualities and can come in a range of bright colours. The exact specification can be altered to suit the activities you want to play and the performance qualities needed. We can also apply anti slip line markings to these courts in multiple colours so different sports can be played in the same area. We have installed these EPDM rubber courts at many locations in the UK including schools, sports clubs, universities and leisure centres. They can be made to suit recreational play as well as competitive events and matches in a number of sporting activities. Many athletics clubs will also have this flooring type installed for running tracks, long jump runways and high jump fans as it is ideal for competitions. These specifications can all be adapted to suit different budgets so please get in touch if you’ve got a question about costs. Feel free to fill in our contact form if you need some more information on the costs for installing this kind of facility. We have completed many projects throughout the UK so we’d be happy to send over some case studies and references from our previous work. This is a great all round surfacing option and is popular for MUGAs where a range of activities such as netball and tennis are played. Macadam sports facilities provide excellent ball bounce capabilities and can have anti slip paint coatings applied in a number of different colours. We will also add coloured line marking to the surface for multiple sports if you want to use the area as a multipurpose facility. Many schools choose to have this hard court surface as it is versatile enough to be used for a range of sports. It is also fairly easy to maintain as it only requires regular brushing and occasional jet washing to remove dirt. You can choose from a range of coloured paint designs, and the level of slip resistance can also be altered depending on your primary sport. If the area will mostly be used for netball then a higher anti slip rating will be needed. However if it will mainly be used to play basketball or tennis then a lower rating of slip resistant paint can be applied. This is a type of fibre bonded synthetic turf which offers the best all round playing qualities for a wide variety of sports. It is suitable for playing football, tennis, hockey, basketball, netball and other games. It can also be a great alternative surface for athletics tracks and long jump runways if you don’t need the competitive standard polymeric rubber flooring. 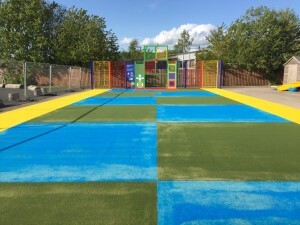 Needlepunch synthetic turf is commonly used for these types of facilities at primary schools where younger children are participating in sport as it provides a softer more impact absorbing surface and can be installed in a brightly coloured rainbow design. The specification for this turf is similar to the 2G pitches as it also contains a layer of sand infill to stabilise the fibres. However this flooring is designed with a curly yarn which encapsulates the sand and makes for a more durable and versatile surface. The shorter pile height also means that it’s suitable for more sports like hockey and netball. We offer this carpet in a number of colours including red, blue, green and yellow so there are many design options to choose from. If you have any budget requirements in mind we’ll do our best to offer an affordable price. As you can see, there are a number of different surface types which you can choose from when installing an artificial sport facility. Each surface specification has individual qualities which are better suited to different sports, so it’s important to pick a material which is suitable for the sports you want to play. It’s also important to carry out regular maintenance for all of these surface specifications. The services we provide for this include drag brushing, pressure washing, infill top up and chemical treatments to prevent contamination from moss and algae. Keeping your sport facility clean will help to reduce the chances of damage and future costs of repairs. It will also prevent the need for reactive maintenance or resurfacing after years of heavy use. It is much more cost effective to look after the facility through proactive methods like this. If you’d like to find out more about the surface types we specialise in and the facilities we install, take a look around the rest of our website and don’t forget to check out our blog. The costs for each service will vary depending on a number of factors but we’ll try to keep our quotes within your budget where possible. We’d be happy to offer you more advice and information on our services so don’t hesitate to get in touch if you have any questions. To send us an enquiry, please fill in our contact form with as much detail as possible about your project and one of our sports pitch specialists will get back to you with some helpful information with regards to installation, quotes and maintenance for your sporting surface.